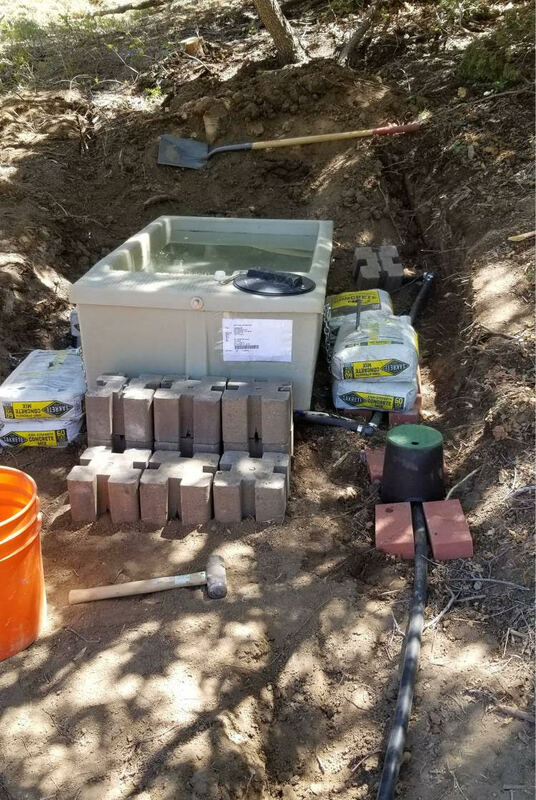 Andrew Jones of All Predator Calls https://allpredatorcalls.com/ did a Drinker-110 install with construction blocks to protect against side wall deflection caused by long term soil compaction. He also added a water drain-line for easy winterizing. Beautiful job. Andrew: We used the 110 drinker and plumbed with a 1 inch water line on the float valve. We did a "hybrid" install using sacks of concrete with rebar anchors chained to the 110 drinker anchor points, forward and aft concrete blocks anchored with rebar, and installed a drain valve and line for late winter draining (deer and elk migrate out of area because of heavy snow). We also installed a approx 6 inches above grade to minimize dirt and debris from being kicked in by wildlife. Everything looks and works perfect with no raising of the drinker or distortion of the tank sidewalls despite heavy usage from elk and deer as well as heavy summer rains. Within a 4-hours of install we had deer using it, now we have visitors all hours day and night.